Well, I made some pumpkin soap the other day...and I made some pumpkin soup, too. But I still had some yummy pumpkin puree' left over between those two projects. I was thinking about giving the rest of it to my dogs, but then....I wondered if the leftover puree would be good for my skin. 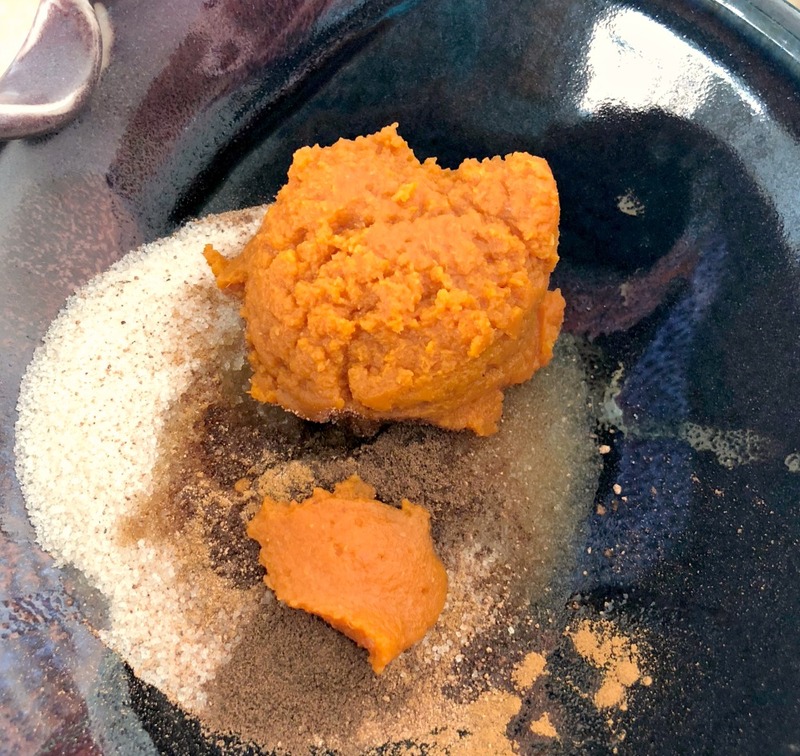 So...I decided, "Why not try out a Pumpkin Spice Sugar Scrub?" So. I did. Here is the recipe, which I am sharing with you because it turned out to be pretty amazing, if I say so myself. For this recipe (which is SO simple), I used a touch of vanilla extract to give it that little extra something. You can find out how to make your own homemade vanilla extract here, if you want. What's so funny is every single thing in this recipe is edible. Plus, it smells fabulous! This is a perfect scrub to make if you are having some girlfriends or family members over and decide to have a beauty time. OR, if you just want to relax yourself---this will put you in a delicious lull. Your skin will thank you, too! This skin care scrub will pair nicely with my Pumpkin Spice Fall Soap Recipe too. Also, you might also like to take a look at this very beautiful Cranberry Spice Sugar Scrub! What Benefits Does Pumpkin Have for Your Skin? 1) Pumpkin helps with skin cell turn over, creating a glowing and bright skin. This is because it's filled with Alpha Hydroxy Acids (AHA's) which exfoliate your skin, along with fruit enzymes. 2) It contains the antioxidants vitamins A and C. These both play a role in anti-aging and collagen boosting. Yay! 3) Pumpkins are high in zinc, which turns out is wonderful if you suffer from acne. Zinc also helps heal your skin. 4) Guess what? Vitamin E and fatty acids occur in high levels in pumpkins. This helps maintain the natural sebum on your skin, which is necessary for protection. 5) And finally--did you know that because the molecules in pumpkin mash are so small, they can actually penetrate the skin layers? This helps combat aging and wrinkles. Win! SCORE! No wonder this scrub made my hands immediately softer and brighter, and even improved Mr. V's. I was seriously wondering about that. I think pumpkin puree is going to become a regular part of my personal beauty regimen. I think a face mask using this scrub would be perfect! Click Here and Never Miss a Thing! How easy is this? Just combine and mix! *** 1/2 tsp pumpkin pie spice (I may have been a little more generous, as I love spices, and I never measure anything.) **If you don't have pumpkin pie spice, just combine cinnamon, clove, nutmeg, allspice, and ginger. It's ok to mix and match. I wish I had taken a picture of Mr. V.'s hands before he put this on them---they were seriously a LOT more black and dirty. He works outside all day, and his hands are always grungy. I think I found a solution...because look below! Step 1) Mix everything together in a bowl. Step 2) Use. And enjoy. Try not to eat it up! Note: You can use this as a body scrub, a facial scrub/mask, and even a great scrub for gardener's hands. I've included before and after pics of Mr. V.'s hands (which are terribly filthy when he comes in after working all day outside) so you can see what a wonderful job it does! This was a light round one. He scrubbed again, and I have never seen his hands cleaner. AND they were a lot softer too. Sorry about the callus. 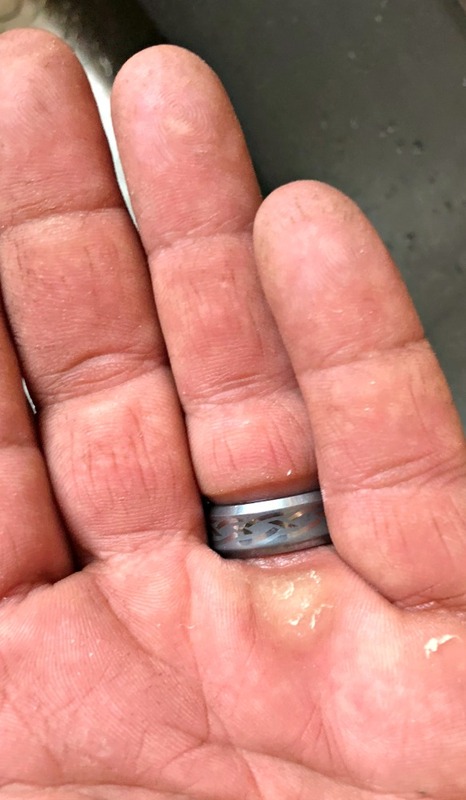 He calls his calluses his "resume." And really, they are! If he had treated this scrub more like a mask and let it sit---I think even lovelier things would have happened! I'm sorry this article is not longer, but really, this is how super easy this scrub is to make! Not only is it super simple, it's delicious and smells fabulous too. And, it works. I have nothing left to say---except you should give it a try. Especially if you have leftover pumpkin puree! 1) How long will it last? Since this scrub is made with pumpkin puree and has no preservatives, I'd say about a week in the fridge and maybe a day or two on the counter. 2) What is the consistency like? At first, it's pretty grainy because of the sugar. But I think because it has more moisture in it due to the pumpkin puree, the sugar tends to dissolve after a day or two. I thought this would be a problem, but it still worked great when I cleaned up Mr. V.'s hands! 3) Could you give this scrub as a gift? If you gave it right away upon making it, it would be a really neat "ready-to-use-right-now" present. However, you really can't expect it to keep. I think this would be a really fun project to do with your daughter, grand daughter, friends, or female member of the family. Actually, some men may just love this too, because it does smell so good! Sugar or Salt? Which Makes the Best Skin Care Scrub? Pumpkin Spice Hot Process Soap Recipe---DeeeeLISH! Check out the blog for more articles on soaps, salves, skincare, essential oils, and herbs! What do you think? Have you ever made a scrub with a food before? I just love when I accidentally come across something natural that is great for more than just one thing, don't you? P.S. If you haven't already, get signed up for our newsletter! You'll never miss a thing, and I have three free eBooks for you, too! Join the community! Click Here to Get the Free Newsletter and eBooks! This would be fun to make with a girlfriend get-together, if you do those kinds of things. I think I'll make this for my daughter and mom when they come to visit! Or any other lady (or man) who asks to give this sugar scrub a try!